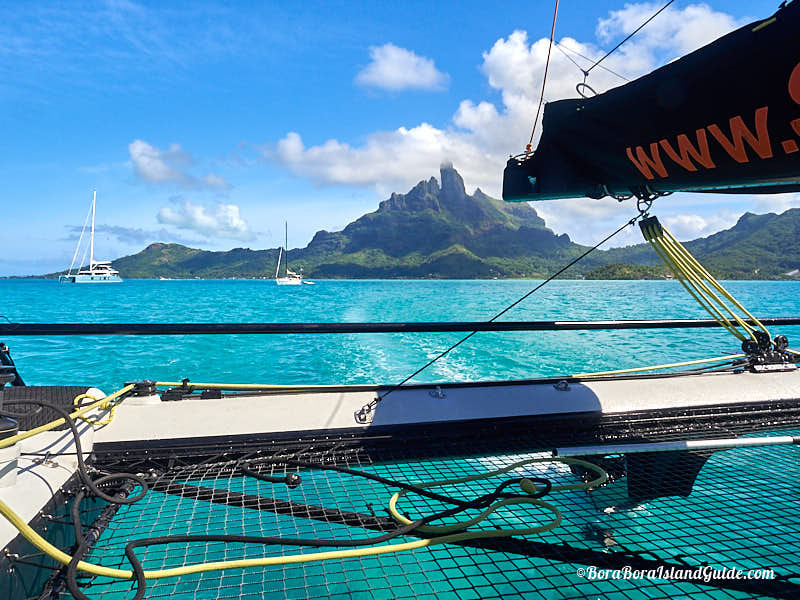 We were on the hunt for the best things to do in Bora Bora when recent visitors told us that sailing Bora Bora with Vitamin Sea was an essential experience to have. So before our June vacation I reserved a place on the half day sailing and floating bar excursion. On our arrival at St Regis resort we caught our first glimpse of Vitamin Sea and were impressed by her streamlined body and the comfortable netting that would carry us over the water. 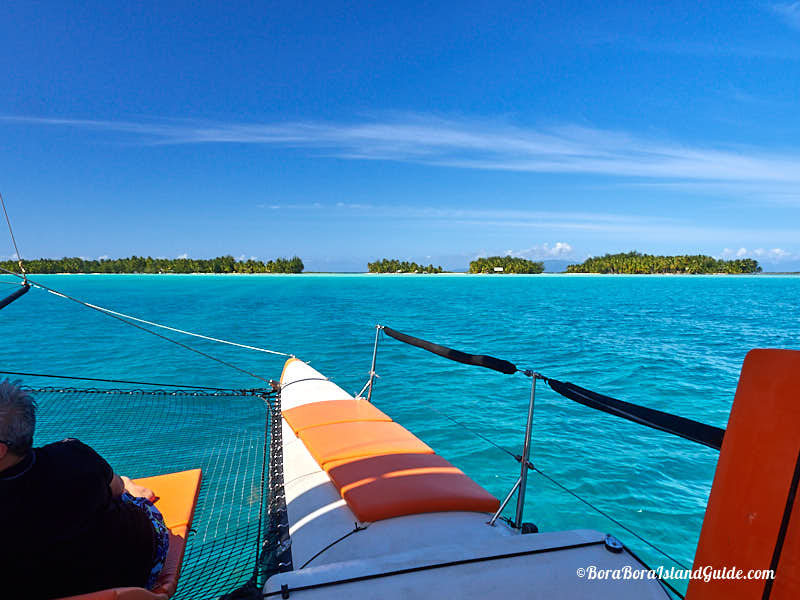 We were looking forward to climbing aboard, as sailing on the Bora Bora lagoon would be a new experience for us. Our sailing day came around and we had perfect sunny weather – but the air was still! Not a puff or breeze to be felt. We rode our bikes to the dock and, as we were greeted by the crew, Captain Nick calmly assured us that he knew where to find the wind. 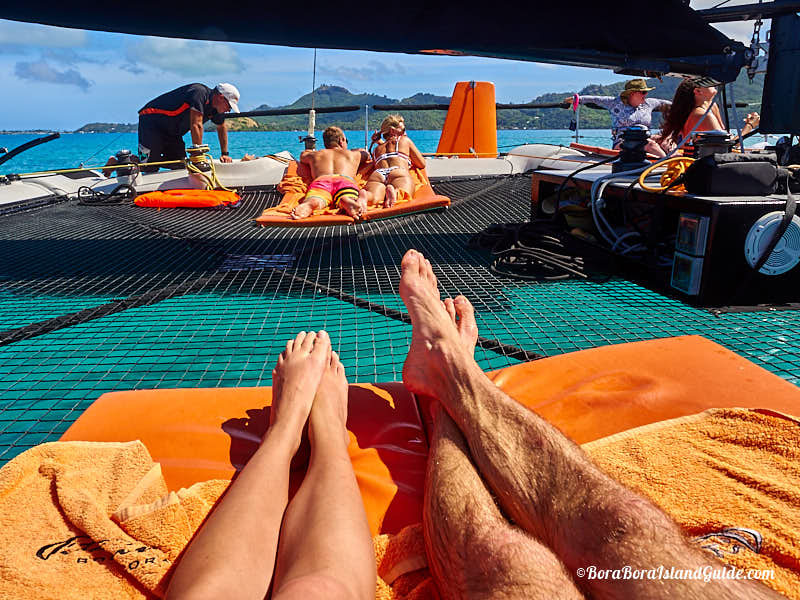 On climbing aboard Vitamin Sea we found that the catamaran is made up of 4 netted areas, with a padded mat in each for support. The excursion only takes 4 couples, so each has ample space and privacy in their own netted area, with a cushion and towel to lounge on. After everyone had settled in, Captain Nick set us on our way with a small engine to fuel us. He headed south to find wind. 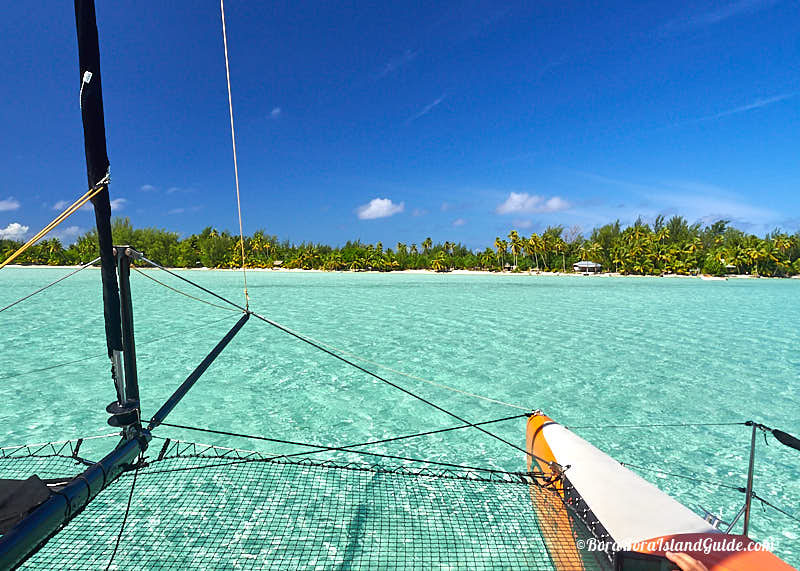 This happens to be the most beautiful area of the lagoon with the clearest water and most varying shades of turquoise. If I was the wind I’d hang out there too! As we slowly moved past prime views of Mt Otemanu we felt the wind pick up, and the sails were hoisted! 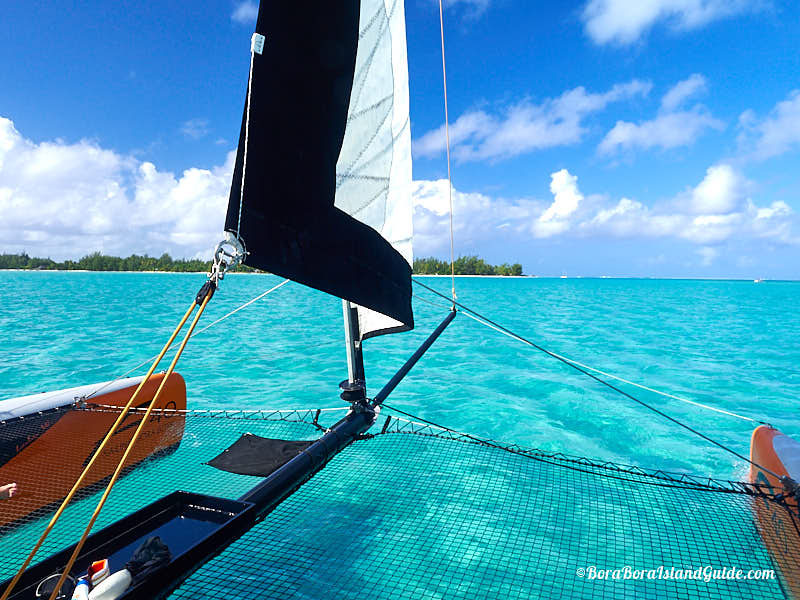 That's the beauty of the Vitamin Sea catamaran - it's so simple, streamlined and light that it can sail in very little wind. So every time out there’s likely to be a sailing experience. I lay in the sunshine, with turquoise water rushing below, mesmerized by towering Mt Otemanu gleaming in the morning light. It felt like we were flying; the smoothness and silence of sailing is so magical. As we glided along I saw an opportunity to capture the lagoon and mountain to take home on my camera. Most excursioners were cuddling with their sweetheart or talking with crew. 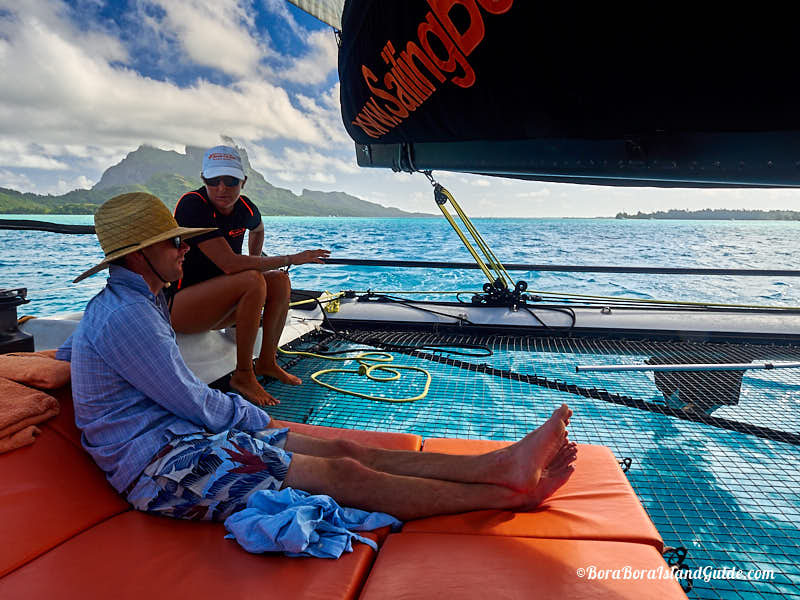 Throughout the sailing a member of the Vitamin Sea team was available to chat about Bora Bora and answer questions. 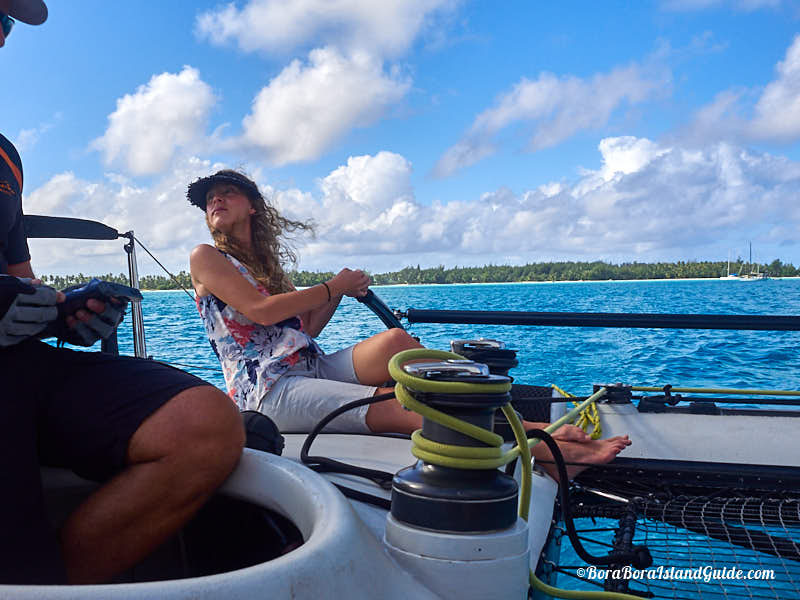 Talk of the wind led Kiki, who'd been sailing most of her life, to discover that she shared other passions for the wind with my fiancé Tom - windsurfing and kite surfing. The friendly crew has a mix of knowledge, and a wealth of interesting life experience to share. Captain Nick invited me to join him at the helm. Sailing Bora Bora took on new meaning as I took control of the vessel and saw a couple of stationary yachts directly ahead. Nick directed me when to turn, and how much to turn, and to my relief we glided right between the two yachts - but began cruising back towards the motu. I had to quickly duck under the boom and rush to the other side of the catamaran to continue steering. Phew, I did it and the feeling was exhilarating! Nick talked me through one more turn where we suddenly headed directly towards Mt Otemanu. Thankfully I didn’t topple Bora Bora’s signature rocks (and be banned from the island) but, under Captain Nick’s instruction, successfully completed two gybes! This was the most exiting part of the outing - probably for the passengers too. The crew enjoy giving guests a turn at sailing Vitamin Sea, so if you want the fun, let Nick know when you board. How could I present with good vibes without my own snorkel and flippers! Learn from my mistake. 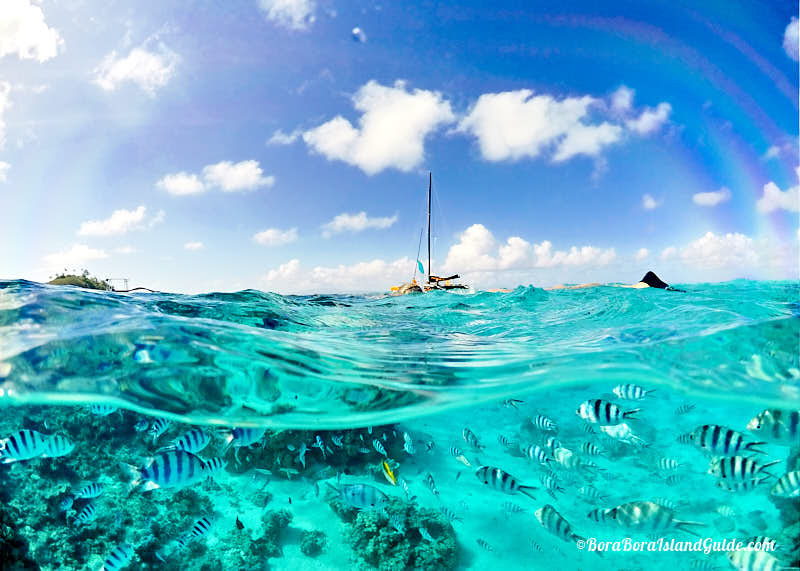 Always take your snorkeling gear on any lagoon excursion; or ask your tour provider the day before if there could be any snorkeling stops. 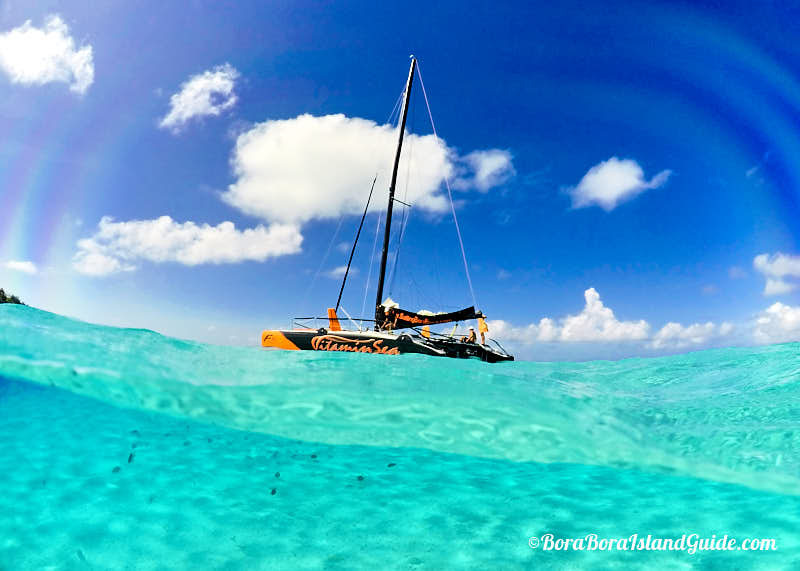 Although the Vitamin Sea sailing catamaran did have snorkeling equipment for us to use (though no flippers) I suggest you bring your own well-fitting gear. There are no strong currents but with large areas to explore it’s tiring without the propulsion of flippers. We swam around in the Aquarium with a crew member - who is a marine biologist - leading the way. This coral gardens is aptly named, as it’s always teeming with fish. After our surprise snorkel, we sailed swiftly to stop in shallow water, a couple hundred meters from a motu beach. Now the frivolity began. Coconuts were opened, champagne was popped and snacks were served on a floating bar, with the backdrop of Mt Otemanu and Bora Bora Island. 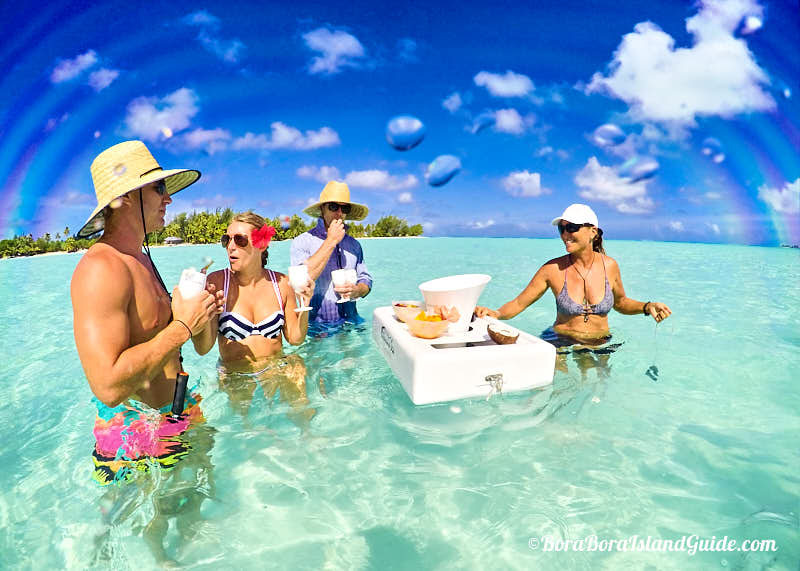 The group cheered in unison as each couple shared the story of what bought them to island paradise: a honeymoon, a college graduation, a 50th birthday, and us - the Bora Bora Island Guide team - searching out the best things to do in Bora Bora. This Vitamin Sea excursion isn’t just for couples, it’s perfect for any celebration – even to have a reminder that life is for enjoying! Want to reserve your space on this awesome tour? After a few bubbly bottles were emptied and we’d enjoyed a frolic in the shallow water while getting to know each other, it was time to head back. The group joked about voting the captain off the ship “survivor” style so we could stay out longer. 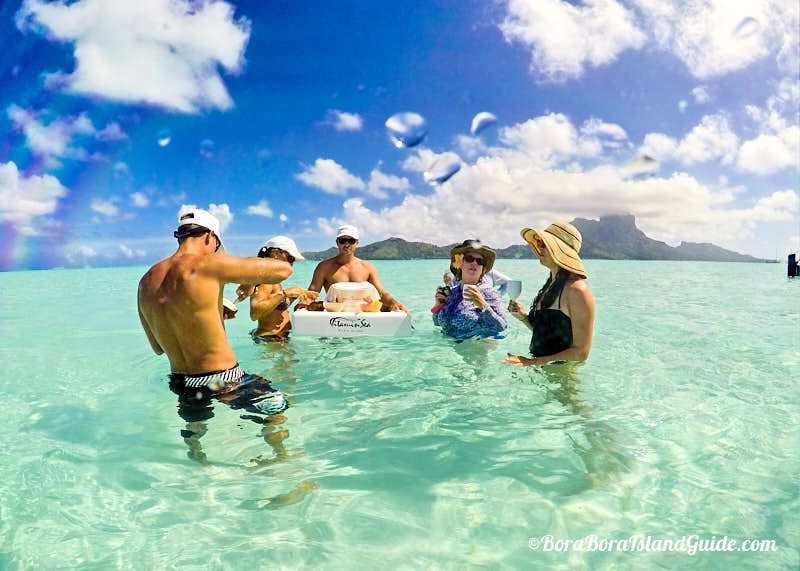 No one wanted the Bora Bora sailing experience to end. The return trip provided excellent photo opportunities as we sailed smoothly past the Intercontinental Thalasso and Le Meridien over-water bungalows and pretty motus. On arrival at the St Regis dock (where the Vitamin Sea catamaran is docked) those from other resorts were swiftly scooted away in the Vitamin Sea speed-boat, which is also available for private tours. We all had big grins as we said a genuine thank you and good bye. 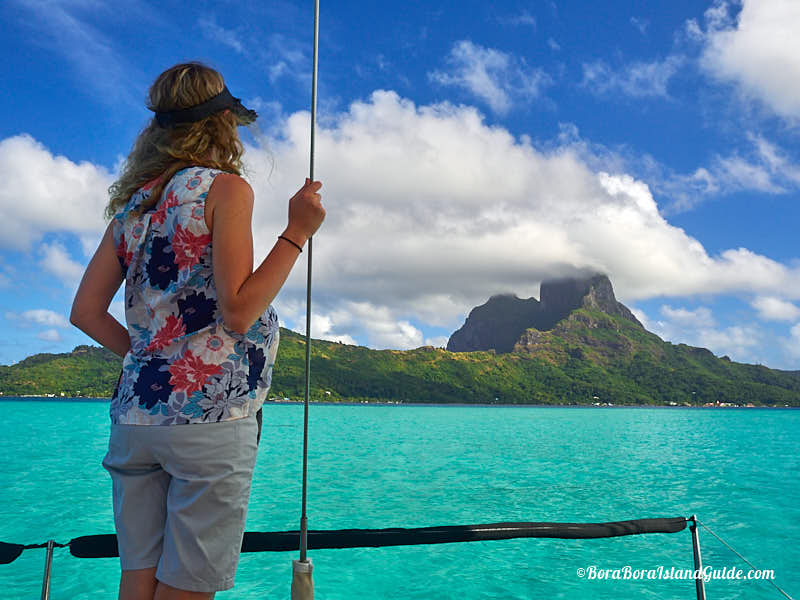 Sailing Bora Bora lagoon was a joyful treat! Tom, my fiancé exclaimed that it was the best activity we had done! Dramatic views from every direction! 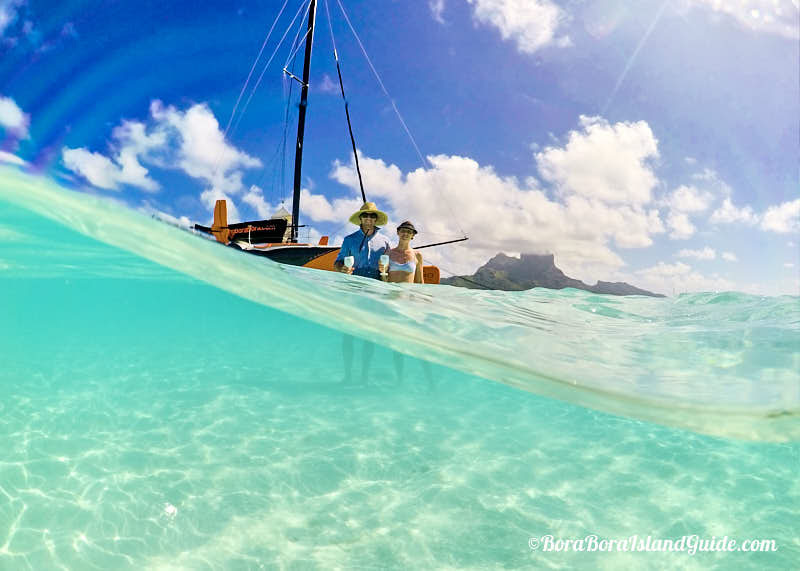 Vitamin Sea provides some of the most exclusive activities in Bora Bora. 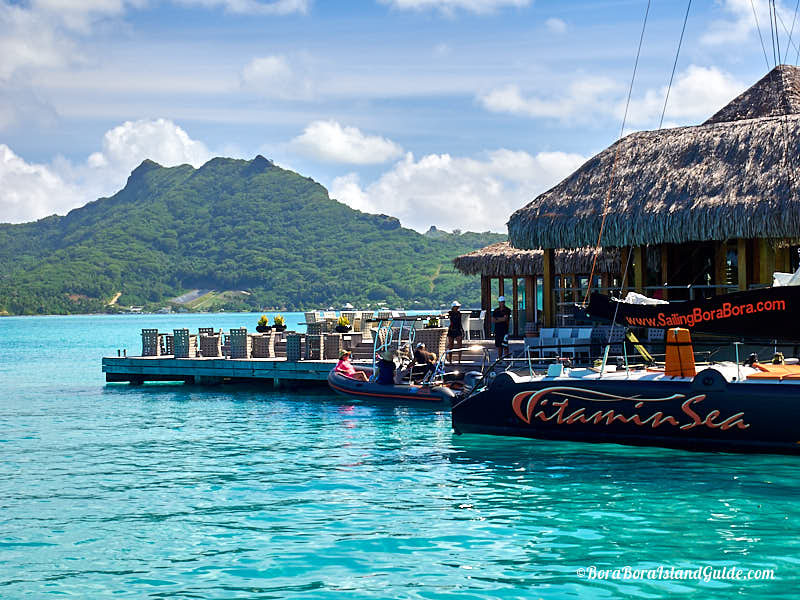 There are numerous water tours offered in all types of power boats but few opportunities for sailing Bora Bora’s lagoon. 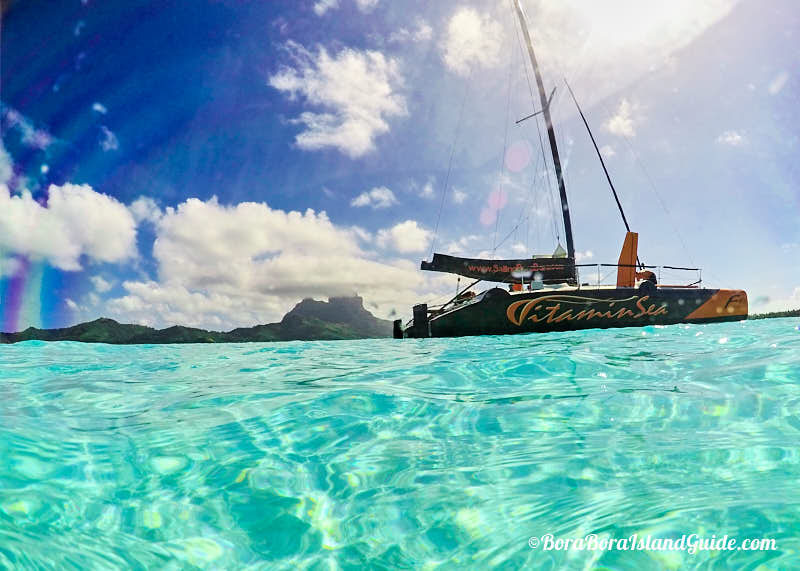 If you want the awesome feeling of sailing Bora Bora with Vitamin Sea, be sure to book well in advance. We tried to book the sunset cruise 3 weeks before our vacation but it was sold out for the entire 2 weeks we were vacationing. Numbers are very limited. Ensure you don’t miss out. It’s easy to check availability and book here. 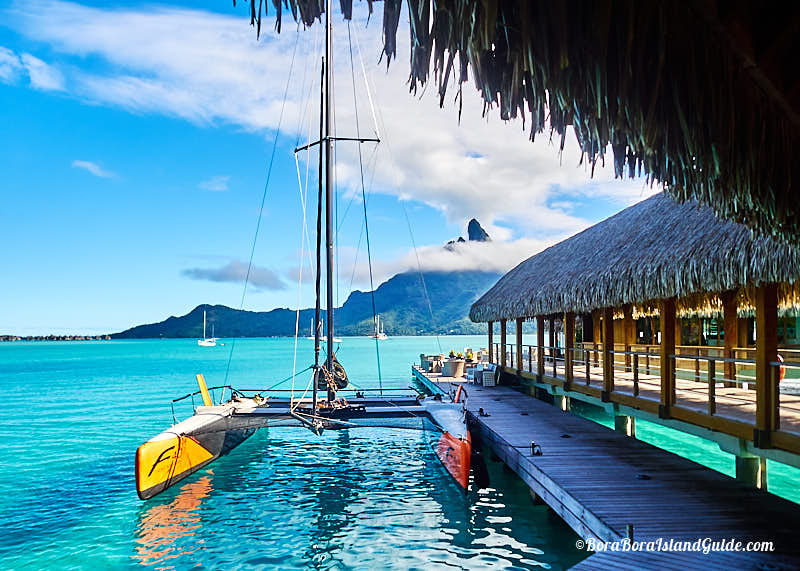 Other exceptional excursions offered by Vitamin Sea – which would be incredible too - are a sunset sail, and a full day private tour with lunch on a motu or at the Yacht Club.